George's Story... Hi everyone! My name is George. I'm a handsome German shepherd/Collie mix and super-friendly young man; I love meeting new people of all shapes and sizes. My favorite things are crispy lettuce, chopped carrots, dried chicken, and most of all, my stuffed bunny! I get frightened pretty easily and use the bunny for comfort or to show you that I'm ready to play. The lady taking care of me is still trying to figure out whether or not I can be the same fun guy with dogs. When I see other canines it's hard for me to decide whether to bark, whimper, run, or ignore them altogether. Mostly, I get really scared and want to move away as fast as possible. Kennel-like environments are definitely too exciting for me, but being the only pup in my current household suits me quite well. My foster mom gets to see how great I am while spoiling (only) me with all her love and attention. She thinks some of that greatness is due to my amazing house manners, though I'm working hard at showing her those same manners during our daily walks. I'm getting better at not pulling on the leash and doing awesome/am a total champ at being calm enough to sit when directed. I understand when she tells me to 'stop', 'sit', or 'stay', though can be easily distracted by my surroundings. Being a larger dog, I need to get out for some exercise, feel the breeze in my fur, and to stretch my legs. If you're a runner, jogger, or even a brisk walker, then I'm the guy for you. It'd also be amazing to have a yard of my own for running around and enthusiastic exploration. Due to my size and energy, I'm best suited to a home with older children or adults only. I'm 100% house trained and never had an accident inside. I'm also crate trained and can sleep through the night without a problem in my crate, though I prefer to sleep guarding the hallway or on my big bed. I like being close, have no problems in trying to be your favorite lap dog, and absolutely loved being loved! This cuddly, active love bug is excited to meet you and ready to bring lots of happiness to his forever home!! George weighs approximately 60-70 lbs. He is not currently crated during the day or at night, stays off of the furniture when alone, and is not destructive. His typical day includes: a 45-60 minute (early) morning walk, hanging out/sleeping at the house during the work day, then running around the yard and playing with toys at night. The best family for George would be patient, energetic, and committed to giving him the training needed. 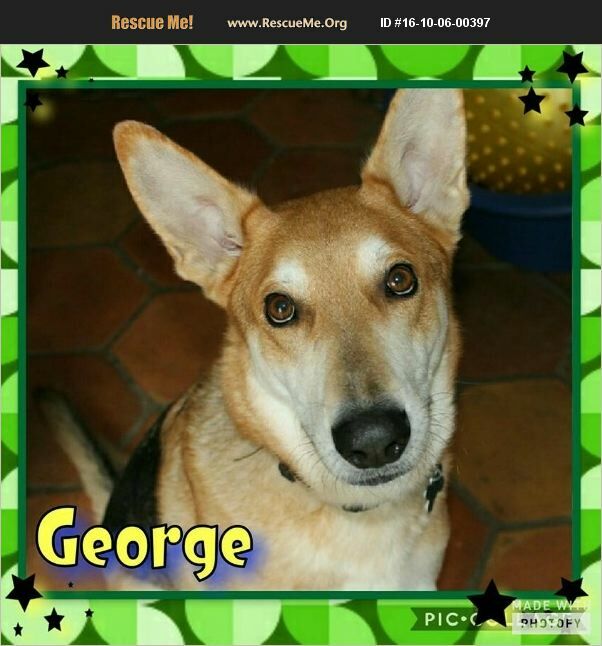 George is a Male German Shepherd / Collie Mix that we estimate to be born around September 1, 2014 and currently weighs 60-70 lbs. PUPPIES: Young puppies that have not had their second round of puppy shots will not be at the Adoption Center for our weekend adoption events. If you are interested in adopting a puppy, please fill out an application on our website http://www.k-9angelsrescue.org/k9_angels_rescue_application_to_adopt.html. If your application is approved, a meeting can be arranged. Also, we only adopt young puppies locally due to the 4 month timeframe it takes to get them fully vetted and altered. OUT OF STATE ADOPTIONS: We do allow out-of-state adoptions for dogs, however, the adopter MUST come to Houston to get the dog and take the dog home with them. We do not allow our dogs to be shipped. However, we only adopt young puppies locally, due to the 4 month timeframe it takes to get them fully vetted and altered. SPAY/NEUTER: As we believe proper healthcare of one's pet is a requirement of good ownership K-9 Angels Rescue only adopts out dogs that have been fully vetted. If the dog being adopted is not already altered at the time of their adoption, the dog will be altered within 2 weeks of adoption at our vet at our cost, with the exception of puppies which will be altered as soon as the puppy is ready. NOTE: All dogs are officially the property of K-9 Angels Rescue until they are altered by our veterinarian. Please LIKE and share our Facebook page: www.facebook.com/k9angelsrescue. Thank you!